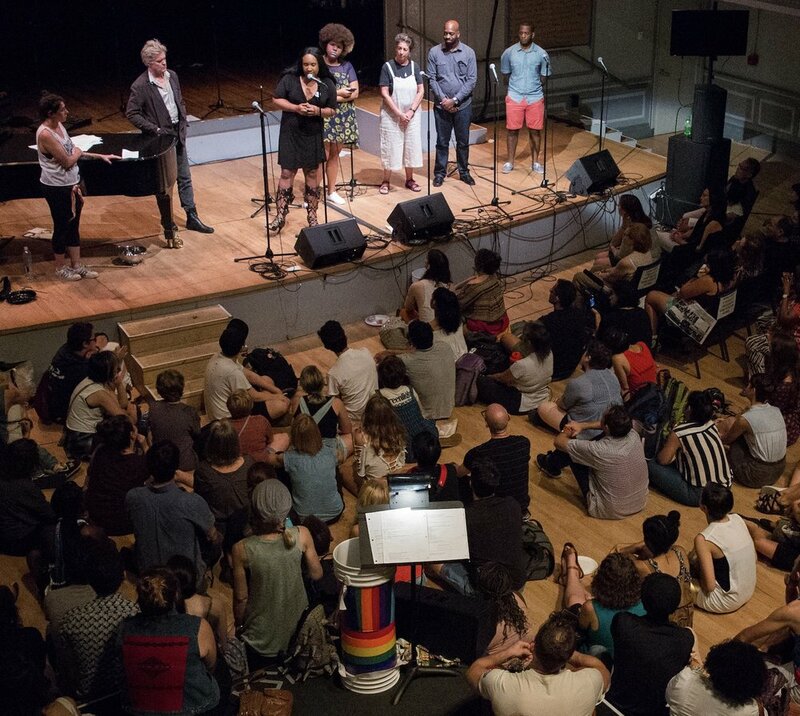 Post-show engagement with activist organizations whose missions matched that of the show. Photos by Em Watson. We began with in-depth research on community organizations around the city that work with and serve youth and seniors. We contacted each of these orgs about the casting of the show, which was also the first step in a broad awareness campaign. Once casting was complete, we moved to designing unique pre- and post-show engagements for a group of activist non-profits that we considered to be a great fit based on the content of the show. They included Make the Road, Opening Act, Elders Share the Arts, Anti-Violence Project/Trans Women of Color, The Gathering for Justice/Justice League NYC, and Rise and Root Farm. These orgs were able to meet the public before the show and to introduce themselves formally onstage after the show. We also designed for time and space for raising funds each night for these local organizations. Performing for two sold-out performances, The TEAM found an incredibly talented and diverse cast who performed in front of enthusiastic crowds that, indeed, looked like NYC. Each activist organization was able to connect with hundreds of members of the public for the first time; many of these audience members were inspired to learn more and signed up to volunteer. The organizations were able to collectively raise funds together at each performance and divide the funds equally.